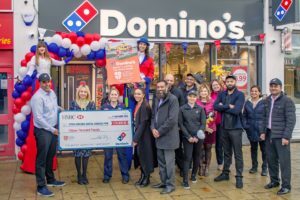 Domino’s Pizza in Luton and Dunstable have raised a fantastic £15,000 towards the Luton and Dunstable University Hospital’s (L&D) Appeal to build a Helipad on the Lewsey Road site. 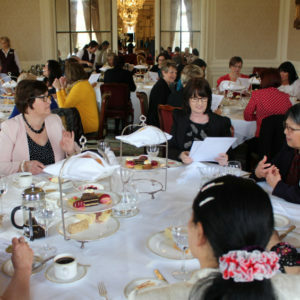 The £15,000 was raised through various promotional activities and events which have taken place over the last couple of months, and is the first part of a fundraising drive to raise a total of £100,000 for the Helipad Appeal. Team members from our local Domino’s have participated in fundraising challenges, such as the Love Luton Marathon and a 10K Run, and held fundraising days at their stores, and donated proceeds from pizza sales. The cheque was presented at the grand opening of their newest store in Riddy lane in Luton on 7 November to Sarah Amexheta and Bianca-Lee John from the L&D’s Fundraising team, and L&D A&E staff nurse Emma Chandler.